Many 3G networks use ATM on their internal interfaces, e.g. on the Iub and Iu-PS interfaces. Those interfaces carry both control information (radio environment information, attach/detach messages, location updates) and also subscriber data, for instance IP traffic. Wireshark understands how to decode those ATM interfaces. Here's an example of an interface sniffed by a GTH. The interface was carrying IP traffic over ATM on an E1 line. Connect one of the GTH's E1 interfaces to the E1 (or T1) interface carrying the ATM interface. You typically do that at a cross connect panel, using a G.772 monitor point. Enable the E1 interface you connected. Convert the captured data to the file format which wireshark understands, libpcap. 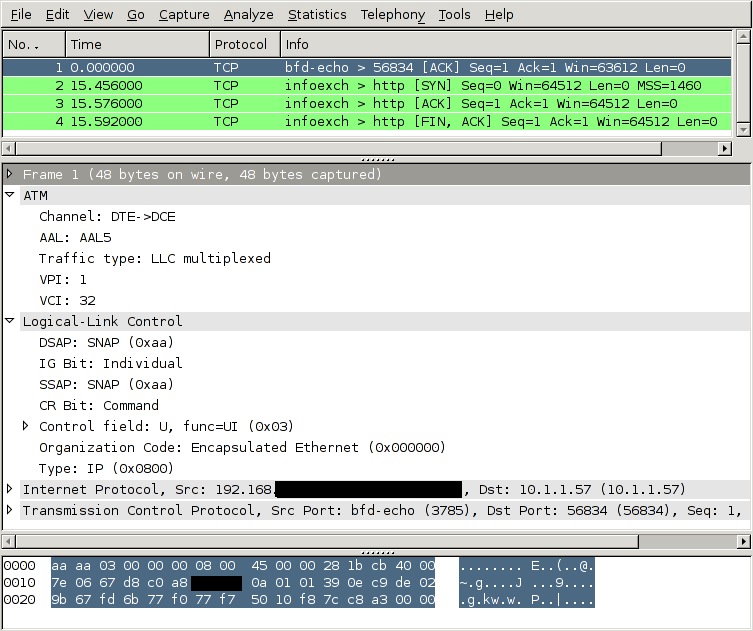 Open the captured file in wireshark. (It's also possible to pipe the captured data into wireshark live, both on Windows and Unix-like OSs). IP traffic on ATM is always carried in AAL5. The timeslot arrangement is usually 1--15 + 17--31. A few sites share the E1 with other protocols, this is called fractional ATM. The GTH can handle either scheme. In this example, the VPI/VCI is 0/5. If you know the VPI/VCI in advance, great. If you don't, the GTH can sniff traffic at the AAL0 interface and show you which VPI/VCI are active on the link. The C version of save_to_pcap can currently only convert MTP-2, not AAL5. If you want it extended, send mail (address at top right). Recent versions of Wireshark, e.g. 1.2.7, can decode such capture files out of the box, without any configuration. Finished.